Sicily is the largest island in the Mediterranean Sea separated from the Italian peninsula by the very narrow Messina strait, Sicily is probably among the regions richest in history, art and cultural heritage, a mosaic of colours and contrasts, from the blue seas surrounding enchanted islands to the magic of the snowy Aetna. 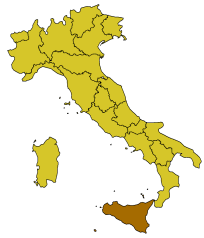 Sicily is located in the central Mediterranean. Its most prominent landmark is Mount Etna, which, at 3,350 m (10,990 ft), is the tallest active volcano in Europe and one of the most active in the world. The island has a typical Mediterranean climate. The region also includes several neighboring islands: the Aegadian Islands, the Aeolian Islands, Pantelleria and Lampedusa. Sicily’s sunny, dry climate, scenery, cuisine, history, and architecture attract many tourists from mainland Italy and abroad. The tourist season peaks in the summer months, although people visit the island all year round. Mount Etna, the beaches, the archeological sites, and major cities such as Palermo, Catania, Syracuse and Ragusa are the favourite tourist destinations, but the old town of Taormina and the neighbouring seaside resort of Giardini Naxos draw visitors from all over the world, as do the Aeolian Islands, Erice, Cefalù, Agrigento, the Pelagie Islands and Capo d’Orlando. Many Mediterranean cruise ships stop in Sicily, and many wine tourists also visit the island. The island has a long history of producing a variety of noted cuisines and wines, Sicily is nicknamed God’s Kitchen because of this. The region offers all sports from watersports, hiking, horseback riding in the summer months to skiing in the winter months. If you are looking for hospitality, fun, good wine & food Sicily is the place! Sicily is well connected with the mainland by ferries and by aircrafts from the major cities. There is a good railway service on the island to the major cities. Ports connecting to the mainland are Messina , Palermo and Catania.